Crafts that are not knitting or spinning go here. I went to New Mexico, for the Taos Wool Festival with Laura, we took a weaving class with Liz Gipson. It was my first time in New Mexico and the scenery was stunning. Mountains, just hanging out like it’s perfectly normal to wake up and see the sun rise over a mountain! Pictures in a Flickr album: 2017-10 Taos Wool Festival. So much potential… What would you name my skull? 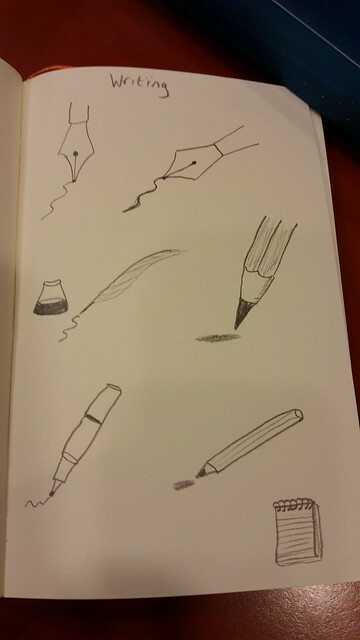 It's for drawing practice. No, really, it is. 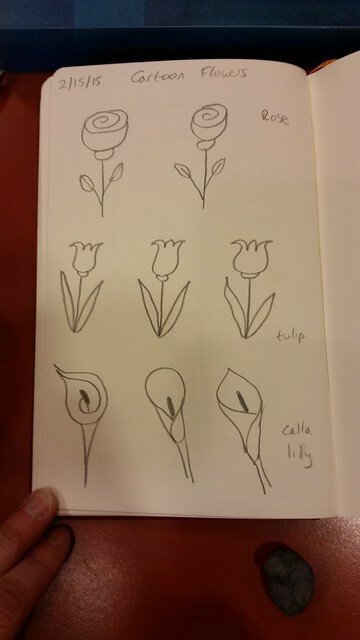 I want to be someone that sketches on a regular basis. I have drawn something in my sketchbook every day for the last two weeks. Nothing is a masterpiece, but I’ve been experimenting with letter forms, faces that show emotions, lots of spirals, some cartoon roses and tulips, suns, squirrels, and it’s been good. I scheduled a time each day to sketch. First thing in the morning, after I write my 5 year diary and my gratitude diary (make it a routine). No fancy Art required, spirals and circles are OK (make it so easy you can’t NOT do it). Mark an X on a visible calendar on the days I sketched (visible feedback on new habit). Planning to keep this up through January (habits take 66 days to form). The stuff in brackets is advice I’ve read on James Clear’s website and eBook on Habits. 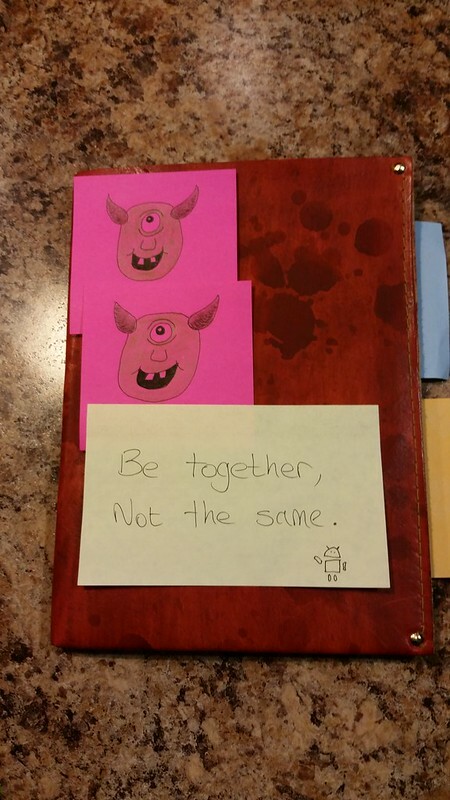 I’m reading through Mike Rohdes The Sketchnote Handbook when I need inspiration. Next sources will be Danny Gregory’s Art Before Breakfast, and Betty Edward’s Drawing on the Right Side of the Brain. I used to do snapshot posts a while ago of what was on my mind and what I was working on. I read Shawn Blanc’s Now page, which refers to Derek Sivers Now page, so I’ll put mine up periodically. Link in the sidebar or these posts. I’ve added a category of Now so I can find them again. The To Read queue is getting unweildy, I might use Blinkist to knock some of these out if they’re available. Really need to finish the Jackeroo cardigan, it has POCKETS. So many pieces of women’s clothing are lacking a functional pocket. Training for black belt in Chinese Kenpo at Tracy’s Karate, several black belt techniques still left to learn. 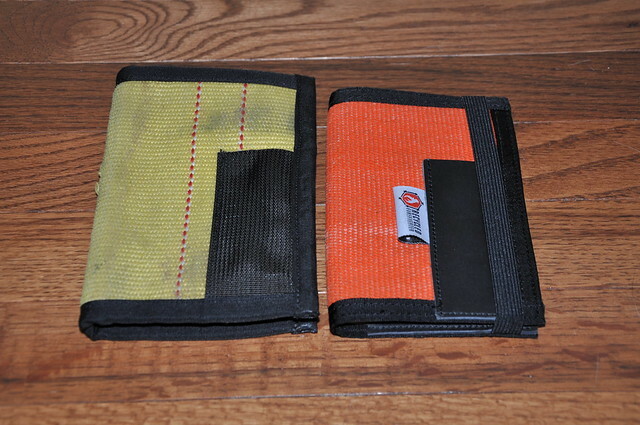 Recycled Firefighter makes wallets and notebook covers from fire hose that’s been taken out of service. It’s run by Jake, a firefighter in Kentucky, and he sews a lot of fire hose. Some products come with a back story, a note explaining which fire hose was used and why it was taken out of service. These hoses have served anywhere up to 20 years before failing a safety test and getting tossed out. It’s edged with Mil-Spec (military specification) black nylon webbing. It has a slightly stretchy pen holder on the front cover made from the same material that’s used inside for the two flap covers. 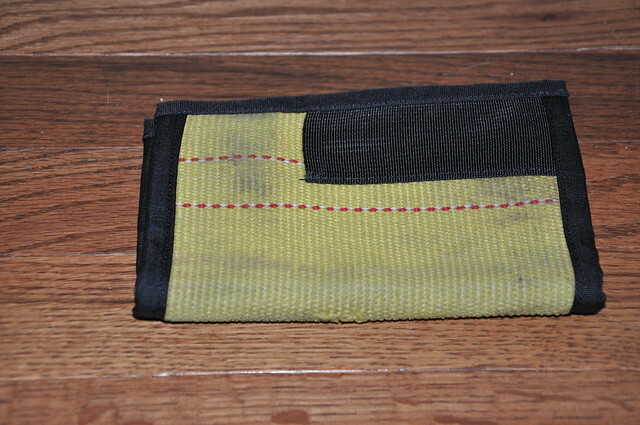 Mine is made from yellow fire hose that’s seen serious use, it’s got scuff marks on it and some dirt for character. There’s a scuff on the spine, but I’m not expecting that to develop into a hole because this fire hose is thick and tough. I’m not a fan of pen holders on notebooks, so I’m not using that part, but it easily accommodates my favourite pen, a titanium Mover from Will Hodges at Tactile Turn. The yellow is easy to find in my backpack, and I’ve used an eminently replaceable Field Notes Band of Rubber to hold it closed, but it’s not necessary. I like that this cover has no parts that can wear out, or get loose and saggy. My notebook is safe inside. This is the v2 Inspector, and the orange just pops! I think this is a much younger piece of fire hose. This version has a leather pen holder, I can get my Mover pen in but right now it’s a tight fit. 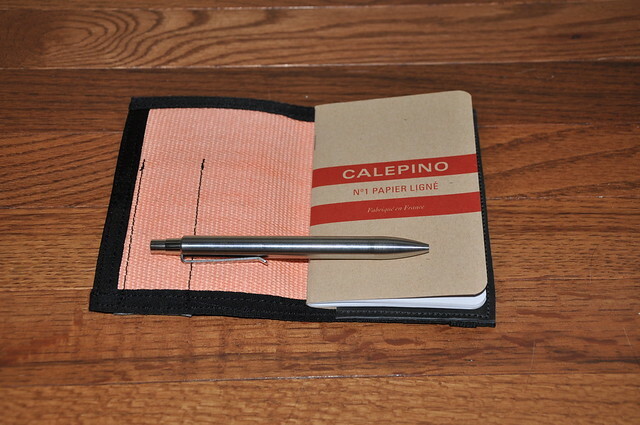 The biggest difference between the two is that the v1 had two flap holders on the inside, and the v2 has just one, made of leather, holding the back cover of a Calepino notebook (far better paper for fountain pens than Field Notes, mine came from CW Pencil Enterprise). 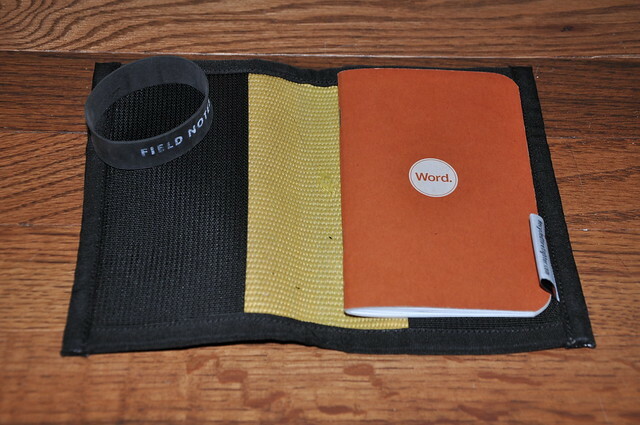 The v2 also adds an elastic strap to hold the cover closed, that is sewn into the back of the cover and would work like a Moleskine or Rhodia strap. The Recycled Firefighter tag is on the outside of the v2, and on the inside of the v1. The v2 is smaller and thinner, and feels about the same weight. I plan on using both, but I think my favourite is the v1. 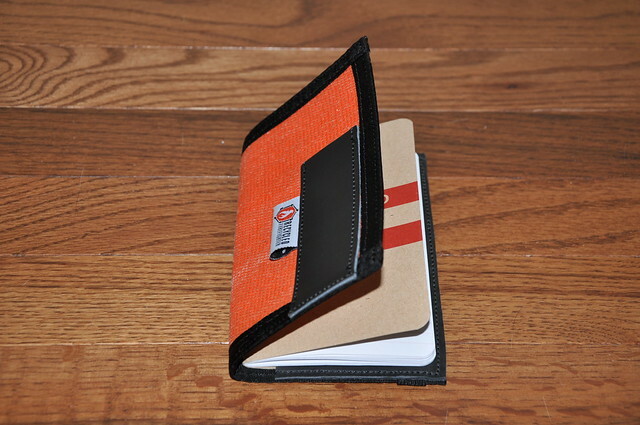 A hybrid v3 where you add a second notebook flap to the v2 (and ditch the elastic strap? Please?) would be about perfect, but for my use, the v1 feels like it was built to withstand a tank attack, where the v2 has a moveable part (the strap) with a shelf life. Also, I could fit two notebooks in the v1 if I wanted to, and the v2 can only carry the one. The finish on both is excellent. The sewn lines are straight, there are no loose threads, the ends of the webbing are melted so they can’t fray. The leather smells great, it’s not too thick and it’s soft. Go support a firefighter, get something made by hand not by machines, and help salvage some fire hose.